In January 2014, New Mexico updated its statutes relating to transfer on death deeds (TODD). This new information is codified at Sections 45-6-401 through 45-6-417 NMSA 1978. The law for transferors is specific about executing and revoking TODDs, but offers almost no guidance to beneficiaries who wish to accept the real estate after the owner's death. Technically, the transferor's death triggers a change in ownership to the beneficiary, but how does that happen? 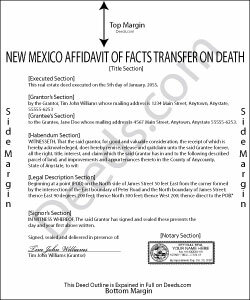 One way to formalize the title transfer is to file an <b>affidavit of facts as to death</b>. This document usually contains details about the recorded transfer on death deed as well as identification of the subject property. By submitting the affidavit to the recording office for the county where the land is situated, the beneficiary has protected his/her interest in the real estate and maintained a clear chain of title. In addition to the affidavit itself, the beneficiary might submit an official copy of both the deceased transferor's death certificate and the recorded transfer on death deed, naming the beneficiary as the intended recipient of the interest in real property. Not all New Mexico counties require these documents; some refuse to accept death certificates for recording at all, citing privacy concerns. Overall, even though the transfer of title rights to the beneficiary happens as a function of law, it makes sense to formalize it by recording an affidavit of facts as to death. Before submitting the affidavit for entry in the public record, check with the local recording office to verify the correct supporting documentation. Remember that each circumstance is unique, so contact an attorney with specific questions or for complex situations.